Jimmy Fallon has done a lot for video games by portraying them on The Tonight Show Starring Jimmy Fallon as a legitimate way of having a fun, nostalgic experience. This runs in stark contrast to other mainstream media figures of his stature who prefer to approach them more cynically or as a hobby reserved strictly for kids and nerds. The above video is just one wonderful reason why Jimmy Fallon knows what he is talking about. He picks up Goldeneye, recognizing it as one of the best and most influential video games in history, and rather than bumbling his way through it by himself, he gets former James Bond actor Pierce Brosnan to have a go at multiplayer with him, living out his childhood dream. Fallon is ecstatic to be playing the best James Bond game with the corresponding James Bond actor, and it just feels so genuine when Fallon utterly destroys him. 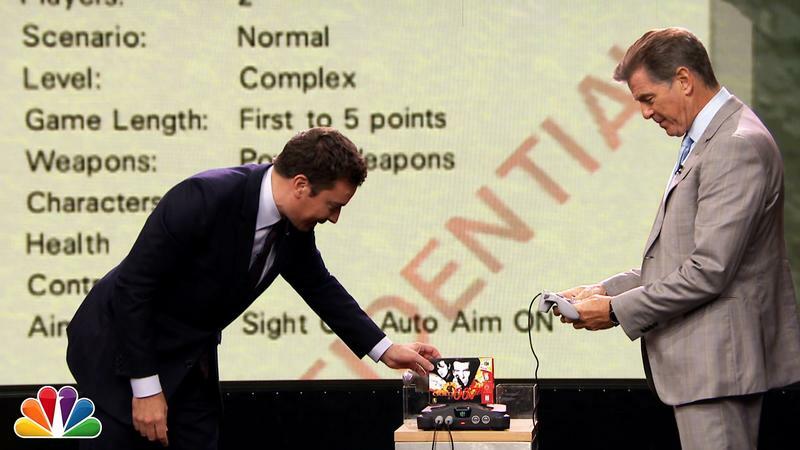 Fallon and Brosnon then embrace over the fact that they played a legendary video game together. If all that's not enough, then the crowd's reaction to the Goldeneye box should make me sleep with a smile on my face tonight. Were this any other show, it would have be the latest James Bond game on Microsoft's Xbox One or Sony's PlayStation 4, sponsored by EA of course, as the host and Daniel Craig awkwardly bumble through a video game not a single person on Earth has any emotional attachment to. Doesn't exactly make for compelling television, does it? The mainstream media still has a long way to go in recognizing that video games are a nostalgic medium with a rich, evolving history. They are so much more than the latest corporate trends or latest time sink kids want to drown themselves in for a week or so. Of course, Japan has already caught onto this and even occasionally mentions Yokai Watch, Pokemon or Dragon Quest on daily morning shows with a fond bursts of interest or nostalgia. Whether or not the hosts genuinely feel that way is up for debate, but at least they try. Taking it a step further, Fuji TV, one of Japan's premiere networks, even has an absolutely wonderful television show called Game Center CX dedicated to video game nostalgia. Host Arino Shinya's genuine love for old video games has turned the show into an international sensation, and it is currently in the middle of its 18th season. Thank you Jimmy Fallon for doing what you do.